There are few experiences in life that touch us as profoundly as losing a loved one. It can be a time when our lives are turned upside-down and for a while we may drift along, carried by the goodness of others. But life goes on and with help and support we move forward, always remembering. Family notices are about remembering. They offer us one way to remember our loved ones publicly and to thank those who helped us during our time of need. You will probably be familiar with many types of family notice, from seeing them in your local newspaper. In this short guide, we have outlined the main types of family notice. Most are obvious from their title, others need a little more explanation. Family notices include Acknowledgements, Month’s Mind announcements, Anniversaries and Birthday memorials and at set times during the year, families also publish notices to remember their loved ones on Mother’s Day, Father’s Day and at Christmas time. Each type of family notice is explained over the following pages, including examples, templates and checklists, where appropriate. There are a number of places to publish Family Notices. Where you choose to publish your notice will be influenced by a number of factors including, but not limited to, tradition (what’s usual in your area or in your family), visibility (will it be seen by the people you want to see it, including those who do not live in the local area or buy the local paper) and cost, this is an important factor for many as the cost to publish a family notice varies greatly, from tens to hundreds of euros. Most local newspapers charge to publish a family notice and prices differ from one publication to the next, with some insertions priced per line, others per word or column, often with an extra charge for a border, picture, colour print etc. Consequently, it is important to ask how much the notice will cost and to know exactly what you are getting for your money. RIP.ie, with over 150,000 visits every day, offers another option for publishing family notices. You pay a modest fee, templates are provided, there is no word limit, you can add up to three photos of your loved one and importantly, you can save a draft of your notice which you can then discuss with family to make sure that everyone is in agreement with the wording. 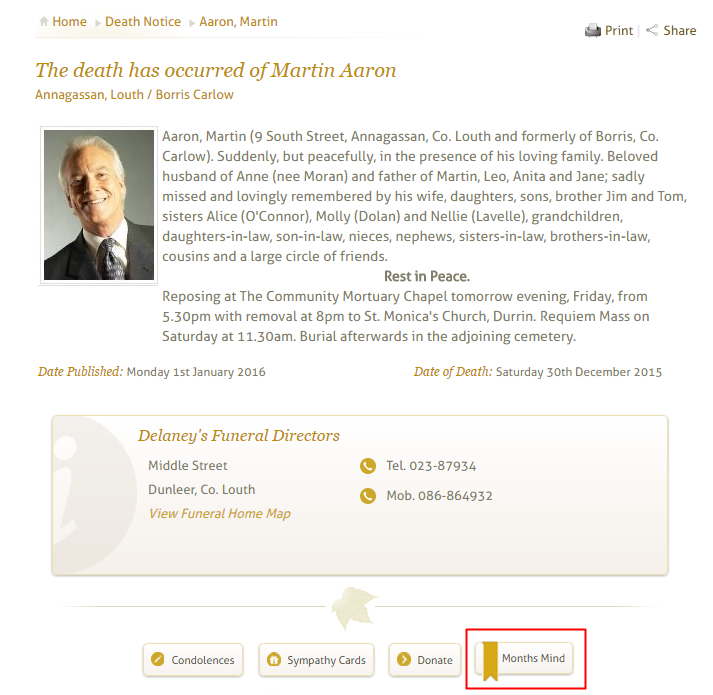 The notice remains listed in the Family Notices section on RIP.ie for up to 5 weeks, easily searchable by county, name or type of notice and all family notices that you publish on RIP.ie are stored in your member’s area. In this guide we look at each type of Family Notice individually. The Acknowledgment is the family’s thank you to all those who helped and supported them in any way, before, during and after the funeral. 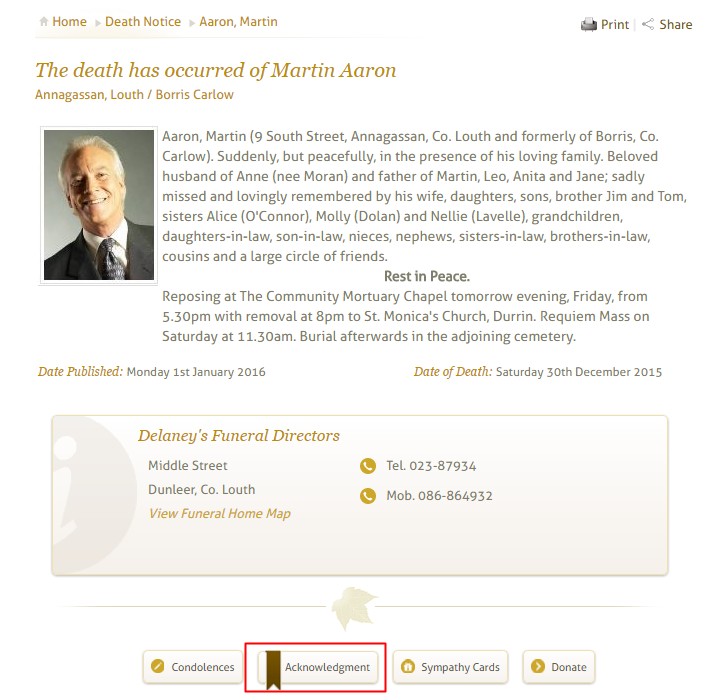 Here is an example of how a family notice, in this case an Acknowledgement, looks on RIP.ie. The Acknowledgement receives special treatment on RIP.ie, as this is the family’s thank you to all those who helped and supported them in their time of loss. So, as well as showing in the Family Notices section for up to 5 weeks, it can also be linked permanently to the original death notice on RIP.ie, as shown below, readily available any time the death notice is viewed, giving a lasting record of events. and viewed by clicking the “acknowledgement” button (highlighted below). In many parts of Ireland, the Acknowledgement is published approx. one month after death, to coincide with the Month's Mind. In other parts of Ireland, the Acknowledgement is published approx. one year after death, to coincide with the First Anniversary. It can be difficult to know what to write in an acknowledgement and for this reason, we provide templates for you, shown on the following pages, as well as a checklist of those you may wish to thank in your acknowledgement. You can also add photos of the deceased to make the acknowledgement all the more personal. The family of the late (name) of (address) who died on (date) would like to thank most sincerely all those who sympathised with them on their great loss. We offer our heartfelt thanks to the many friends, neighbours and well-wishers who visited our home, attended the wake, service and burial and who provided emotional and practical support for us at this difficult time. For those who telephoned, travelled long distances, sent floral tributes, cards and messages of condolences, as well as those who made charitable donations, we are truly grateful. A special word of thanks to (name those you would like to thank specifically, see checklist included with this guide). To those who helped in any way, your contribution made our loss more bearable. As it would be impossible to thank everyone individually, please accept this acknowledgement as an expression of our deepest gratitude. The Holy Sacrifice of the Mass will be offered for your intentions (optional). Optional - The Month’s Mind Mass for (name) will be held on (date & time) in (name church/venue). All Welcome. Optional - The First Anniversary Mass for (name) will be held on (date & time) in (name church/venue). All Welcome. A notice to announce a Mass or gathering to be held approximately one month after the funeral, in memory of the deceased. Often includes a short verse and personal sentiment. We provide a template, as well as a selection of popular verses, to guide you. You can also add up to three photos, to make the announcement all the more personal. 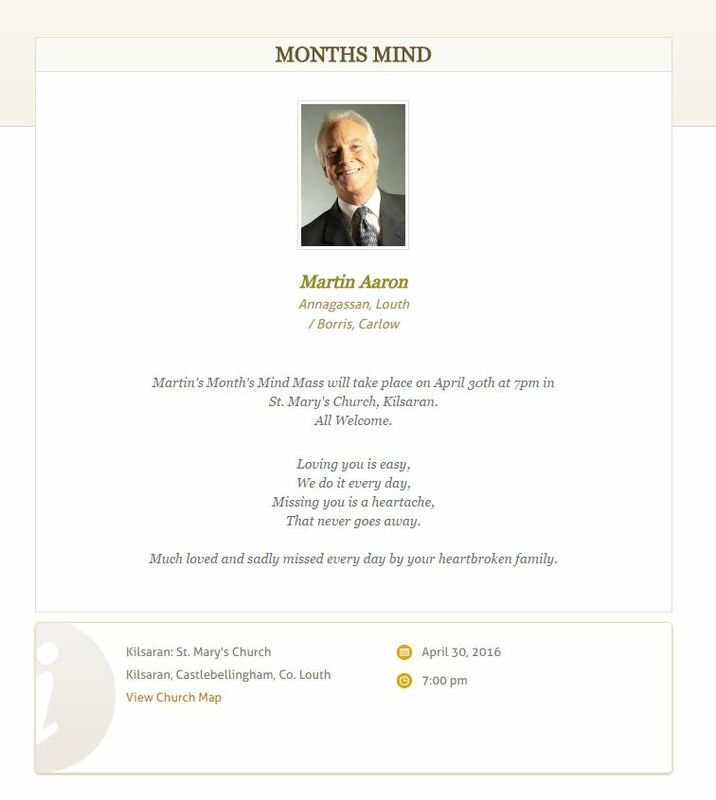 As well as showing in the Family Notices section, a link to the Month's Mind notice can also be displayed on the death notice for up to 5 weeks (shown below), so that people viewing the death notice can immediately see when and where this will take place - a great help for those who may have missed the funeral and want to attend the Month’s Mind, so it’s a good idea to publish the Month’s Mind notice as soon after publishing the death notice as possible, when viewing of the death notice is highest. Below is a sample text for a Month’s Mind notice which you can edit as appropriate. Remove any brackets and replace with information relevant to your own situation. The Month's Mind Mass for (Name) will take place on (date) at (time) in (venue). All Welcome. Much loved and sadly missed every day by your family, (list the family members). Published to honour the memory of a loved one on the occasion of the anniversary of their death and to give details of any services which will be held in their memory. Often includes a short verse and personal sentiment. Anniversary notices can be published every year, to coincide with a loved one's date of death, to remember their passing. Often a Mass or other gathering will be held to mark this occasion. Below is a sample text for an Anniversary notice which you can edit as appropriate. In loving memory of (name) whose (third) anniversary occurs on (date). Deeply loved, sadly missed and always remembered by (list family members). An anniversary (Mass / gathering) will be held in (name & address of church/venue) on (date at time). Published to remember a departed loved one on their birthday. Often includes a short verse and personal sentiment. We provide a template, as well as a selection of popular verses, to guide you. You can also add up to three photos and include details of any Mass, Memorial Service or gathering being held. Below is a sample text for a Birthday Memorial which you can edit as appropriate. Remembering (name), whose (twentieth) birthday occurs on (date). Love and miss you always (list family members). 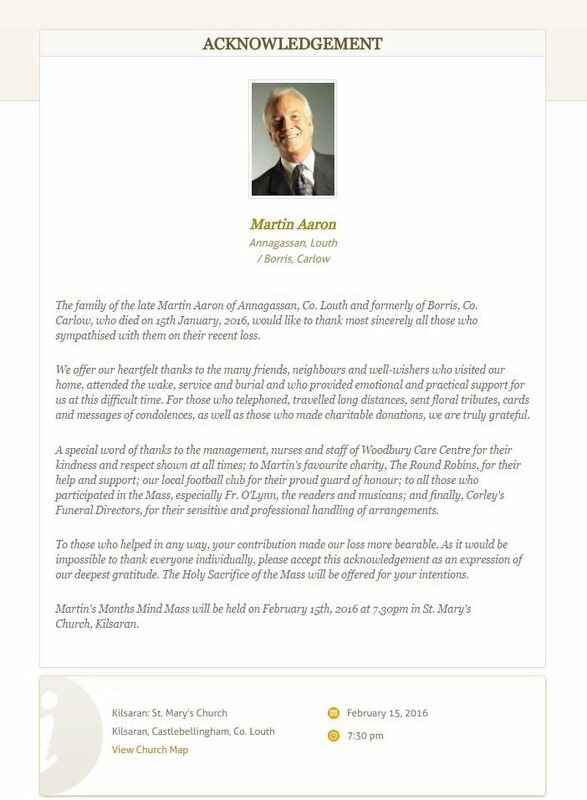 A notice to announce a Service, Mass or gathering held some time after the funeral, in memory of the deceased. May include a short verse or personal sentiment. Often held where the deceased died abroad and this gathering serves to bring friends and family in Ireland together to remember their loved one. We provide a template, as well as a selection of popular verses, to guide you. You can also add up to three photos and details of where the Memorial Mass or Service is being held. 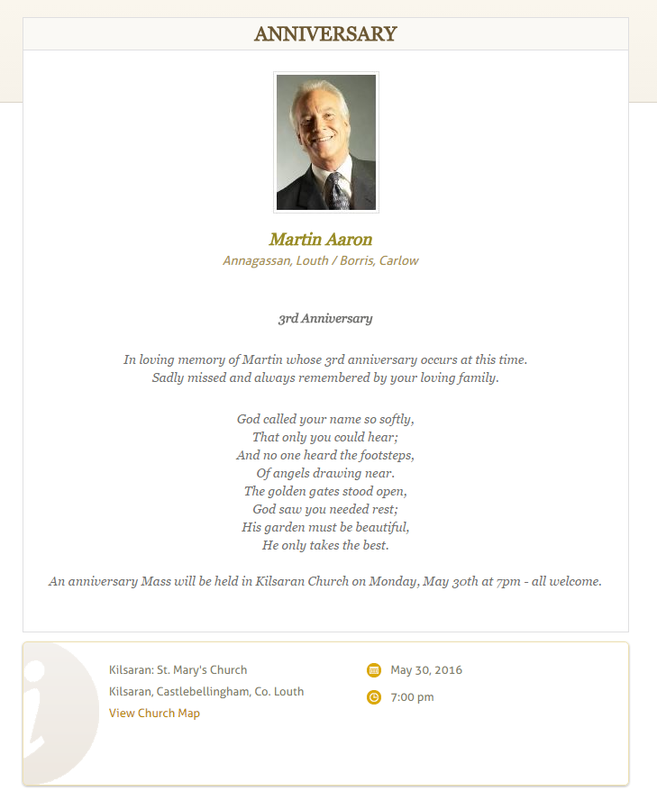 Below is a sample text for a Memorial Mass or Service which you can edit as appropriate. A (Memorial Mass / Service / gathering of family and friends) will take place on (date) at (time) in (venue) to remember the life of our beloved (name) of (address) who died on (date).